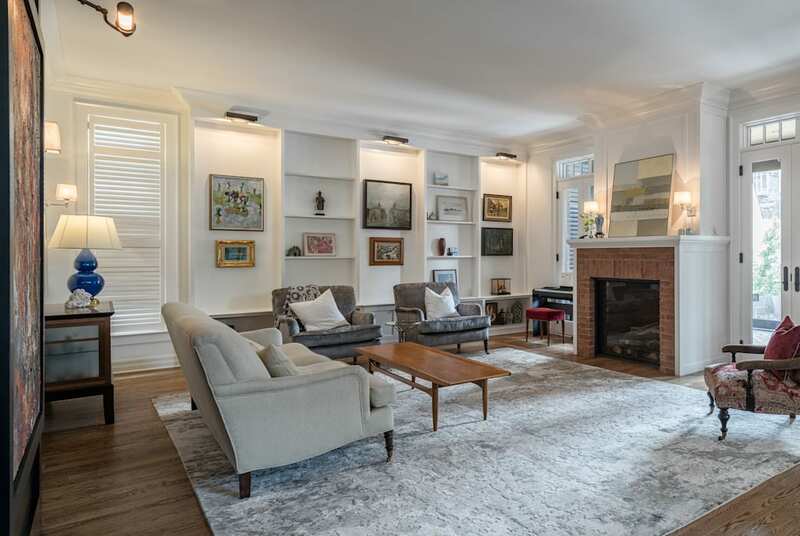 Located in one of the oldest neighbourhoods of Ottawa, this Glebe home is a welcomed resident to the street. The homeowners were looking for a design that would be respectful towards the historical fabric, complement their neighbours and respond to their specific family requirements. Their appreciation for the historical context and their need for a formal layout with contemporary conveniences provided the framework for the design. From the street, the formal entrance is sheltered by a bay window and the porch canopy. Upon entering the home, the entrance and dressing foyers, and the stairwell hall provide layers of separation needed for the living areas. The living area is large and open creating a welcoming, flexible space that can adapt to the family’s needs over time. Central to the layout is the stone fireplace separating the living room from the screened-in porch. Opening on to the screened-in porch, the french doors open freely and extend the interior space. The screened-in porch connects the house to the backyard and provides a perfect space to enjoy the landscaped setting. The centrally located stairs provide rich texture as one climbs to the second floor. Here the classic layout continues and includes a shared sunroom for the daughter’s bedroom, a sitting room and transitional space between the hall for the master bedroom, built-in bookshelves, and a study/library for the son’s room. The third floor is reminiscent of a New York rooftop office with fireplace, sleeping rooms, kitchen and deck overlooking the city. Located for privacy, the room is flooded with sunlight during the day and cools off during the evening when the deck gets used most. Although a large home, it fits well into the neighbourhood and the thoughtful interior spaces express classic understated elegance that is a perfect reflection of the homeowners.